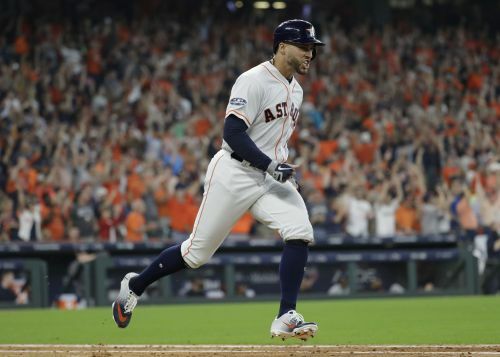 HOUSTON (AP) — It's October and George Springer, Jose Altuve and Alex Bregman are all hitting home runs once again, helping the Houston Astros to a postseason win. A year after launching a World Series-record 15 homers in winning their first championship, the Astros picked up right where they left off, hitting four home runs to power past the Cleveland Indians 7-2 Friday in Game 1 of the AL Division Series. Martin Maldonado also connected for the Astros, who didn't waste any time displaying the same power that carried them to last year's title. Much was made about the pitching prowess these teams possess in the days leading up to this game. But it was a bunch of longballs to put the Astros ahead in this best-of-five series. "As much as I've heard different opinions about our offense, it's pretty long, it's pretty good, it's pretty potent," manager AJ Hinch said. "Case in point today." Houston's pop backed up a solid start by Justin Verlander, who bested Corey Kluber in a matchup of Cy Young Award-winning aces in the first postseason meeting between these teams. Verlander took a no-hitter into the sixth inning and got his 12th playoff win. He allowed two hits and two runs in 5 1/3 innings — the Indians finished with only three hits, all singles. Kluber, a two-time Cy Young winner who was coming off his first 20-win season, was tagged for three home runs in 4 2/3 innings. It was a repeat performance from last October's ALDS, when he made two starts against the Yankees and left with a 12.79 ERA. Game 2 is Saturday in Houston. Gerrit Cole starts for the Astros against Carlos Carrasco. The Astros hit 27 homers last postseason — Springer hit five in the World Series and set a record by connecting in four straight games on his way to winning the MVP award. Bregman, coming off a breakout year, got Houston's first hit with his drive to the Crawford Boxes in left field to start a two-run fourth inning. "The only thing I can say about him is without him we wouldn't be here," Altuve said. The 103-win Astros were still up 2-0 when Springer led off the fifth with a full-count homer to left. That made him just the third player in major league history to homer in five straight postseason games. "I'm happy that I was able to help us win in all of those games and be a sparkplug," Springer said. Two pitches later Altuve, last year's AL MVP, connected for his eighth career postseason homer when he also sent one to left field. He began last year's playoffs with three home runs in the ALDS opener against Boston. Kluber watched stone-faced as Altuve headed for first and shook his head slightly as he rounded the bases and the crowd roared with scattered chants of "MVP." Kluber followed up his splendid regular season with another playoff dud. A year after giving up four homers in two starts against the Yankees, the longball again proved to be a problem for him. He left with two outs in the fifth inning after allowing six hits and four runs while walking three. "Last year has nothing to do with today," Cleveland manager Terry Francona said. "They're a good team. He made a couple mistakes. They made him pay for it." Verlander was masterful through the first five innings, with Cleveland's only baserunner in that span coming on a walk to Jose Ramirez with two outs in the first. The Houston right-hander set down 13 in a row after that, fanning seven, including striking out the side in the third. Yan Gomes broke up the no-hitter with his single to shallow right field to start the sixth and Francisco Lindor singled with one out in the inning. When Verlander walked Michael Brantley to load the bases after that, Hinch had seen enough and replaced him with Ryan Pressly. The Indians cut the lead to 4-1 on a wild pitch by Pressly, who came to Houston in a July trade, and got within two when Lindor scored on a groundout by Ramirez. Maldonado, making his playoff debut, connected off Cody Allen for a two-out homer in the seventh. Bregman made it 6-2 with an RBI single later in the inning. Houston reliever Hector Rondon, who Hinch said was "very upset" about not making the ALDS roster, did not come onto the field when he was introduced with the team's reserves before the game. He also was not on the field during the national anthem, but did join the team in the dugout for the game. Rondon, signed by the Astros to a two-year deal in the offseason, was left off the roster in favor of hard-throwing rookie Josh James because of his ability to throw multiple innings. Hinch said Rondon could be used in the ALCS if the Astros advance. Rondon was 2-5 with 15 saves and a 3.20 ERA in 63 games. In a season where openers and using multiple relievers instead of defined starters has become popular, Verlander believes that true starters like him remain very important to the game. "I think you need it," he said. "I think the more relievers get used every single day, it has an effect ... I don't have the answers. But I do believe in innings. I believe in protecting the bullpen. And I believe in a starting pitcher." Cole (15-5, 2.88 ERA) ranked second in the AL with 276 strikeouts this season, only trailing Verlander's 290, and was fifth with 200 1/3 innings pitched. He will be making his fourth playoff start and first since 2015 with the Pirates. He is 1-2 with a 3.94 ERA in those games. It will be just the second career postseason start for Carrasco (17-10, 3.38), who is 4-2 with a 3.45 ERA in eight appearances, with seven starts against Houston.